133710227X -Give students the critical leadership skills and solid understanding of today’s theory needed to become effective leaders in today’s turbulent times with THE LEADERSHIP EXPERIENCE, 7E. Acclaimed author Richard Daft helps students explore the latest thinking in leadership theory as well as contemporary practices at work within organizations throughout the world. Students examine emerging topics, including enhancement of emotional intelligence, leadership vision and courage, and leadership of virtual teams, and they connect those topics to recent world events such as ethical scandals, leader successes and mistakes, and political turmoil. 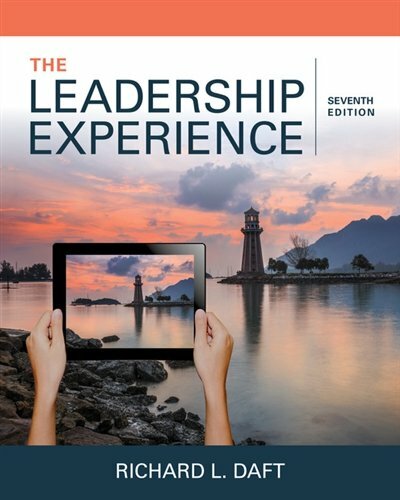 Packed with memorable examples and unique insights into actual leadership decisions, this full-color text includes crisp, clear visuals to reinforce the book’s engaging presentation. This edition’s proven applications, designed for today’s leadership theory and applications course, and a solid foundation grounded in established scholarly research make the topic of leadership come alive for students. In addition, THE LEADERSHIP EXPERIENCE is available with MindTap, an integrated text and online learning solution that enhances understanding of course content and offers opportunities to extend learning.